Barley and oats are important cereal grains in Montana. The top four cereal grains are wheat, barley, rice and corn. Cereal grains have long been considered a staple food. They are easy to prepare and have high nutritive value. Grains were partly responsible for civilization. In order to grow crops nomads had to stay in one place and tend to the land. Thus, settlements arrived and towns were born. Eventually people started milling grains, which involves removing the bran and the germ. These components are actually the most nutritious parts of the grain. The grem provides fat, protein, carbohydrates and vitamins, while the bran provides fiber, vitamins and minerals. Both are a good source of energy, vitamins and minerals. Cultures whose diet depended on grains developed vitamin deficiencies as a result of grain milling. Now, some grains, especially wheat are still milled. However, whole grains are seen as part of a balanced diet. Barley is primarily used for animal feed, and malting, but some is used for human consumption. Feed barley is ground or rolled and mixed with other feed. Sometimes young barley is left unharvested and used for pasture or made into straw. 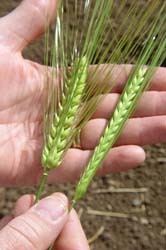 High quality barley is used for malting. It is found in beer, liquor, malted milk and flavorings. Teton County is known for some of the finest grades of malting barley produced nationwide. Fairfield, in north central Montana, claims to be the "Malting Barley Capital of the World". Anheuser-Busch, one of the most famous breweries in the United States purchases much of the barley produced in these areas of the state. Barley can also be used for human food. 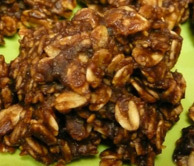 It can be made into bread or used as barley flakes or kernels. 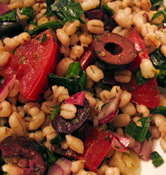 Also, polished pearl barley or pot barley can be boiled and eaten. In 1998, Montana farmers produced 57.5 million bushels of barley, making the state second in the nation for barley production. Barley is grown in every county except for Lincoln and Mineral. It is well adapted to Montana's cool climate and high altitude. Like spring wheat, barley is planted in the spring and harvested in the fall. There are different varieties of barley. Six rowed barleys are the most common and have three rows on each side of the spike. Two rowed barleys are also grown. Oats are also an important grain crop in Montana. It is believed they originated as a weed in Western Europe. They appeared in the barley and were spread when the barley was shipped. Oats are a cereal grain also. They provide a higher food value than any other cereal grain. Oats are most often used as oatmeal, flakes, or rolled oats. They are rich in starch and protein and are used in oatmeal, cake, cookies and breakfast cereal. Oats have no gluten and so they cannot be used for bread. Gluten is the compound that makes bread rise. Sometimes they are sold as groats; whole grains with the husks removed. Most oats though, are used for livestock feed, especially horses. Like barley, oats can also be made into straw, or ground and rolled to be mixed with other feed. The oat plant has a stalk that grows from 2 to 4 feet high. Many small branches spread out from the sides of the upper part of the stalk. Each branch ends in a single spikelet. Most oat plants have 40 to 50 spikelets. Most spikelets contain two seeds, each in a husk. In 1999, Montana farmers produced 3,220,000 million bushels of oats, ranking Montana fourteenth in the nation for oats production. Oats and barley are harvested the same way as wheat, with a combine. They are taken to the elevator in trucks and shipped to various markets. Thank you to Agriculture in Montana Schools and the Vegetarian Society for providing much of this information.